The head is tilted down so I’ll have to correct for that. In fact, he seems to have a tendency to tilt down, probably to leverage his (modestly) dramatic/angled eyebrows. That’s a projective behavior–he’s trying to project intimidation. I’ve seen other guys with angled eyebrows try to do that, most notably Ben Shapiro. His ears stick out for mild nonconformity. The inner ear cup appears to poke out past the outer cup, indicating his inner life takes precedence over his external life. A common manifestation of this is using the outside world as a “painting canvas” for what he thinks and feels. A useful attitude for the artist and the devout; not helpful for the delusional. There’s no intelligence lines on the forehead, the lower eyelids are rounded by male standards and the eyebrows have no loose hairs at the extremities, so he’s of average intelligence. Upper eyelids aren’t visible and ear tragus gap is small, so introverted. His hair is groomed and not tangled so he’s mentally balanced. One concern is his eyes sometimes show the lower sclera in various pictures, which is a sign of fear. The double vertical lines between the eyebrows indicates at least some determination. Nose is straight with a small bulb at the end, so he’s good at handling money. Nose tip is mildly turned up, indicating an open/trusting attitude once you get past his introversion. His head-tilting may be an effort to hide that. The goatee is important on this face but I haven’t yet found good resources on facial hair. 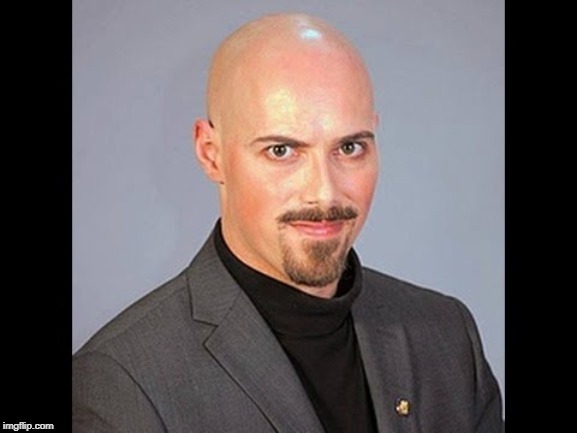 My sense is that the middle third of the face is dominant, indicating status/ambition orientation, but he tried to correct that with a flat-bottomed goatee to appear lower-third dominant, which indicates practicality/stability/manual arts. The status/ambition orientation is confirmed by his appearing well-dressed in nearly all of the photos I’ve seen. Taken together, Aurini is an emotion-oriented guy behind a shell of introversion. I would expect his successes in life to be financial/business rather than intellectual. Probably low-SMV and unhappy about it, yet self-motivated enough to push for solutions. Courtesy of Boxer at the link below. I agree that’s probably iced tea, not scotch. The inner ear cup prominence is at work here; he’s using props in the outer world to appear as who he thinks he is in his inner world. His chin looks stronger than I would have expected. Bad angle to confirm it, though.